Earlier in the topic we saw some highly stylised designs from Slovenia. Back in 1932, the Free City of Danzig produced some equally unusual fish designs on their circulation coins, which must have looked daringly modern in their day. Danzig, 5 Pfennig, 1932. Turbot. Danzig, 10 Pfennig, 1932. Cod. Returning briefly to the scenic/non-scenic theme of earlier in the topic, it is remarkable how most animal designs on circulation coins included very little background, despite the early example of the lion design seen above. 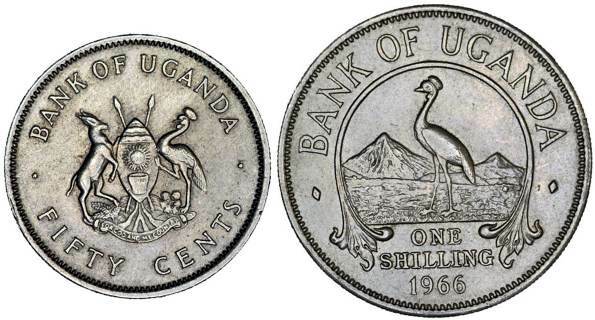 However, Uganda returned to this tradition with its independence coinage of 1966, which paid homage to the earlier designs, though it depicted a crested crane rather than a lion. When it comes to stylised designs of animals, probably the lion tops the list. Among my own favourites are these charming examples from the Lebanon. The French influence is once again highly evident in the style. Lebanon, 5 piastres, 1955. Another superb lion head. See also: Lebanon: trees, galleys and lions. Since the late 1960s, animals (and especially edible ones!) have featured heavily in designs for FAO-themed coins. The Seychelles design above is one of my favourites of this genre. Some animals are used as official or unofficial emblems of various countries, and they appear on their coin designs in this capacity. The Little Owl (Athene noctua) appears on this Greek 10 lepta coin of 1912. It is realistically portrayed, but it is also symbolic of wisdom and a national emblem. In Greek mythology the owl was sacred to Athena, the goddess of wisdom. 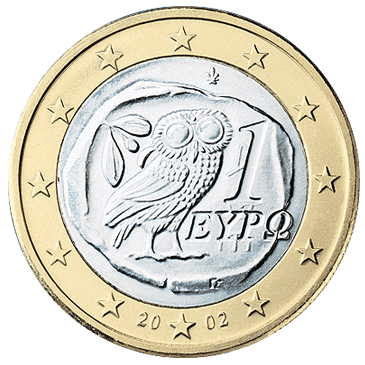 A much more stylised Little Owl also appears on the reverse of the Greek 1 euro coin. The bald eagle has long been the national bird of the USA. On this 1922 dollar the eagle is portrayed realistically enough in itself, but look at those ethereal rays in the background, hinting that the eagle is somehow transcending its earthly nature and symbolising the USA itself. Since 1910, when Australia first introduced its official national coinage, the country has never been without a kangaroo on its coins. Likewise, New Zealand's coinage has never lacked a kiwi. New Zealand florin, 1941. Kiwi. New Zealand, 20 cents, 1967. Kiwi. New Zealand, 1 dollar, 1990. Kiwi. This was the first year of issue for the circulation dollar coin, known colloquially as "the kiwi". 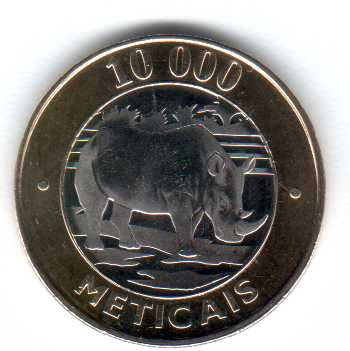 Rhodesia's coin designs always included a sable antelope. Southern Rhodesia, 2 shillings, 1937. Rhodesia and Nyasaland, 1 shilling, 1955. Rhodesia, 25 cents / 2 shillings and 6d, 1964. Since predecimal times, sparrows have always been present on South Africa's designs. South Africa, ¼d, 1924. Sparrows. South Africa, 1964, ½c. Sparrows. South Africa, 1966, 1 cent. Sparrows. South Africa, 1970, ½ cent. Sparrows. 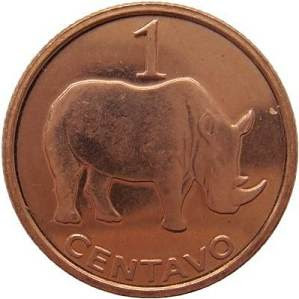 South Africa, 1994, 1 cent. Sparrows. The springbok first appeared on South Africa's coins in 1947. South Africa, 5 shillings, 1947. Springbok. South Africa, 1 rand, 1965. Springbok. South Africa, 1 rand, 1998. Springbok. South Africa, 2 cents, 1966. South Africa, 5 rand, 1998. Wildebeest. South Africa, 5 rand, 2008. Wildebeest. One beast with background scenery that I forgot is the South African wildebeest. Notice that the mountainous background on the 5 rand designs is somewhat amended, compared to the original design on the 2 cents coin. Ireland, 5 ecu collector coin, 1990. Another example of background / no background on an animal design. See also: Irish red deer on Punt and 5 ECU coins of 1990. Another example of background / no background on an animal design. Michael Guilfoyle was responsible for both designs. This is also an example of a design moving from the highest denomination to the lowest. Australia, 20 cents. Design by Stuart Devlin. Having told the story to Stuart, I added that while two coinages featured their respective country’s fauna, there was adifference – the horse, salmon, butting bull, standing wolfhound, seated hare, chicken and chicks, pig and piglets and a flying woodcock of the Irish coinage were unceremoniously ‘plonked’ in the centre of the flan. This was not a criticism, as most reverse coin designs comprise one or more motifs or symbols on the flan. In Stuart’s opinion the traditional approach, ‘does not suit the circular nature of the coin and is not a good thing to do’. Stuart wished to break with tradition and make the design an integral part of the blank on which the coin is struck. In other words, the design spreads to more of the flan than is usual. Compare the Australian decimal and Irish Free State coins illustrated here. Stuart’s innovative approach is truly breath-taking. While the design of each Australian coin is an integral part of the blank, the 20-cent piece is a particularly striking example. This features a platypus swimming through water. Although over 50 years have elapsed since it was created, he still maintains, ‘It is the best coin I have ever designed.’ He achieved the effect by giving it a modulated surface, so consequently the platypus appears to be swimming through water creating ripples as opposed to being stuck on the flan like the salmon on the Irish florin. This unusual feature required working the surface of the coin to create the illusion. It is only by thoroughly studying the subject that forms the design that one can work out the best way of presenting its form in the confines of a circular surface (look at the echidna or spiny anteater on the reverse of the 5-cent), or can capture the animal’s true character, whether it is the contentment of the platypus or the bravado of the frilled lizard. While I agree with the tenor of the above, I wonder why the two examples chosen are both from English speaking countries. For worked surfaces, there are good examples in Finnish commemorative portrait coins. For depth of design, Israeli commemorative coins are exemplary. The example below (source), the Hadassah medical centre at Ein Kerem, shows that the approach works for objects as well as for animals.